Note: This is the first installment in a three-part series that will describe a year in the life of a DWR fisheries biologist. TO MOST BIOLOGISTS, summer means fieldwork, and lots of it. It also means plans that can change rapidly from one week to the next, based on weather patterns and the movement of fish. During the summer, I constantly rearrange my schedule to work around the weather conditions. I conduct fieldwork when fish are most easily captured, and that can only happen if I adapt my plans to what’s happening in nature. This can make for an odd mix of morning, evening and nighttime work, but there are times when I find it preferable to the monotony of a 9-to-5 schedule. I got to take a quick picture with one of the tiger muskies we sampled at Newton Reservoir. During a typical summer week, my time is split about equally between being at the office and being on the water. Like almost any other job, there is daily office work that has to be done. This includes paperwork, data entry, correspondence and meetings. Where my job differs from most people’s is that I spend the other half of my time at northern Utah’s reservoirs collecting data for fishery assessments. Fieldwork is often viewed as the most alluring part of a biologist’s job — you get to work in the great outdoors, travel to lots of scenic places and handle lots of fish. I can’t say I disagree with the popular view, but I must admit that I really enjoy analyzing the data we collect and writing reports about what we find. It’s no secret either, as my office mates often rib me by calling me the office “data dork,” a title I’m proud to own. Most of my summer fieldwork is focused on assessments of bass and bluegill populations. These fish are effectively sampled in the three- to four-week period during early summer when water temperatures range between 60°F and 80°F. Particularly for the bass, this period presents one of only a few short windows of time when we can find these fish in shallow water. So, timing is of the utmost importance. Three to four weeks may sound like a long time, but when you consider all the things that can sidetrack or cancel an expedition (thunderstorms, strong winds, schedule conflicts and the occasional equipment malfunction), it can be a hectic time for a biologist. Bass and bluegill are most effectively sampled at night with electrofishing, so I alter my schedule, as needed, to work evenings and nights. A typical field day sampling bass and sunfish begins at the office in the middle of the afternoon and usually ends around 1 or 2 a.m. When I arrive at the office, I meet up with our technicians to gather everything we need for a night on the water sampling fish. Fieldwork is expensive to conduct, so going through a checklist and bringing backups of almost everything (gas, keys, lights, nets, batteries and lifejackets) ensures there are no wasted trips away from the office. After inhaling my dinner, I take a last look at the weather forecast to check for possible storms or strong wind. If we’re lucky, the winds will be calm and the skies free of storms. It’s typical to have to reschedule a trip a couple of times due to inclement weather, but this time the weather looks good, so we depart. We arrive at the water just before sundown to unpack and situate all our gear. When darkness settles on the water, we work quickly to collect, measure and weigh fish. 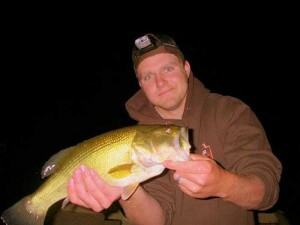 Bryce Roholt holds a largemouth bass we pulled in one night. The electric current just stuns the fish. After we weigh and measure them, we release them back into the reservoir. This sort of operation requires considerable manpower, usually requiring about six people to work effectively. We take two boats and put a crew of three people in each boat. One boat is the electrofishing boat. I run the electrofisher on this boat and use two deck hands to net fish. The other boat we refer to as our “work-up” boat. The crew on that boat takes the fish we net and then measures and records the lengths and weights of all fish. Contrary to popular belief, I never count all the fish in the population. My main goal is to measure enough fish to allow me to make meaningful inferences about population trends in the species we’re looking at. The benefits of taking such a subsample of the population are better control over the quality of the data and efficient use of time and resources. Electrofishing is full of excitement. (If you’re not familiar with the technique, check out this link or video.) Using this technique, we travel the shoreline, netting fish that are drawn to the surface with an electrical current. We have to work quickly, and the hours fly by. Sometimes our netters on the front of the boat are netting fish as fast they can, and they still can’t collect all the fish drawn to the bow of the boat. There’s also nothing like the thrill of watching a trophy-size fish appear from the depths to be caught by an excited netter. Such catches are usually met with boisterous shouts, and I can often tell the size of the fish from the magnitude of the yell. The role of netter usually goes to the fisheries technicians who work for us each summer. These technicians are typically college students who are working on degrees in fisheries biology. They are the biologists of tomorrow, and they bring a lot of enthusiasm to the table. They always get excited when we collect a big fish, and despite my best efforts, I get excited too. Most of the fisheries professionals who work for the DWR are anglers, and it’s hard not to get excited when you see a huge bass in one of your favorite fishing holes. When the last fish is measured, we load up our boats and head back to office. From the office, I drive home on empty roadways. I head straight to bed, and sleep comes easily. The next day will be a full day at the office. I arrive a few hours before noon and enter the data we collected the night before (while it’s still fresh in my mind). At the same time, our technicians work to clean the gear from the night before and get everything ready for our next outing. Tomorrow will be another electrifying night.